I was up the street at Hopworks on Saturday. It was the last weekend of summer and so there were any number of festivals, races and events a person could have done. But how could you miss cold beer and Huffy tossing? 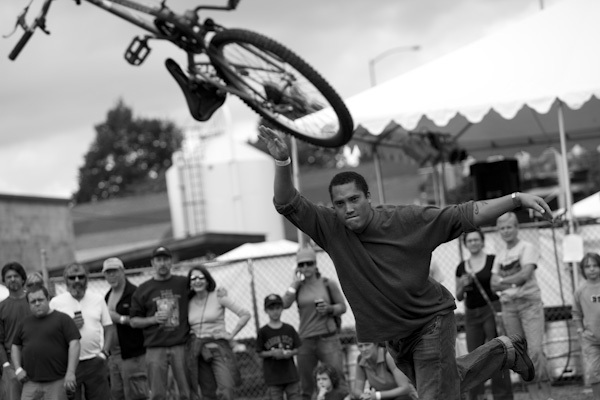 It was a bike-crazy-Portland kind of event…so I posted a few photos on our pdxcross site. Click the photo and it will take you here. This entry was posted on Tuesday, September 22nd, 2009 at 1:20 pm. It is filed under assignments, beer, cycling, the northwest and tagged with cycling, cyclocross, hopworks, HUB, microbrewery, oregon, photojournalist, portland, tim labarge. You can follow any responses to this entry through the RSS 2.0 feed.